Kettlebells are used in the gym to build strength, endurance and explosiveness. The Russian exercise apparatus are becoming increasingly popular and a number of gyms and workout facilities have them for workout enthusiasts to use for training purposes. However, you may need to find substitutes for kettlebell swings if your gym does not have them. Performing arm swings with dumbbells can help you gain upper body strength if you can't use kettlebells. One of the moves that you can do with dumbbells is to hold them in a vertical manner and swing your arms up to head height before bending your elbow. Then swing them back down again until they extend past the level of your upper leg. Do 10 to 15 arm swings with each arm, take a one-minute break and repeat the drill. Doing twists with medicine ball can build strength and explosiveness in a similar manner to using the kettlebells. Take the medicine ball and hold it in front of your stomach with both hands at waist level. Swing the ball to the left and twist your hips fully. Bring the ball back to the center and then swing the ball to the right. Bring it back to the center. Do 15 full twists, take a one-minute break and then repeat the set. Throwing punches at a heavy bag can bring you some of the same benefits as a kettlebell workout. Hitting the heavy bag properly means that you are using your entire body to throw a power punch. That is the same as doing arm swings or lifts with the kettlebell. You are not just lifting the kettlebell with your arm, shoulder or back. You are using all of your muscles to do it. The same holds true when punching the heavy bag. 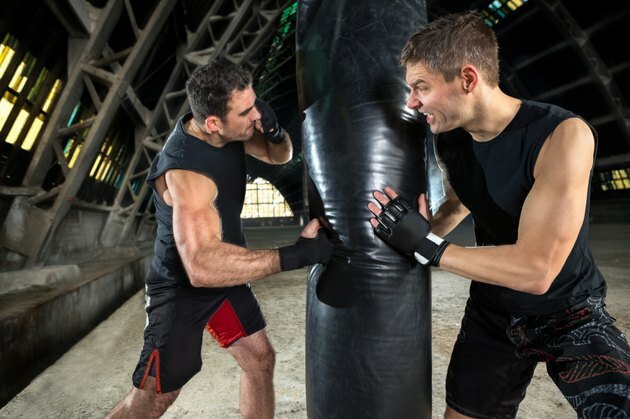 When you have advanced in your workout to the point where you can do two three-minute rounds on the heavy bag separated by a one-minute rest period, you can do the exercises with weighted gloves to give your body an even more taxing workout. The main reason to use kettlebells is to build functional strength. This can benefit all athletes and also anyone who wants to get stronger and healthier in all day-to-day activities. However, kettlebells also build endurance when used correctly. If you don't have access to kettlebells for strength building and endurance, elliptical trainers can also help you in this function when you use the vertical arm handles to keep your body weight in motion. Arm swings with kettlebells can be very taxing. Until you have been checked out on them by an instructor, you should not use them if there is any chance you can lose control. The same holds true when you are using dumbbells for arm swings. Some gyms may take a dim view of workout enthusiasts who generate significant speed while swinging their arms. Use resin on your hands so you can maintain control of the weights while you swing them. Is Swinging on a Swing Good Exercise? Does Jumping Rope Work Out Your Arms? Will My Arms Get Bigger Swinging a Sledgehammer?